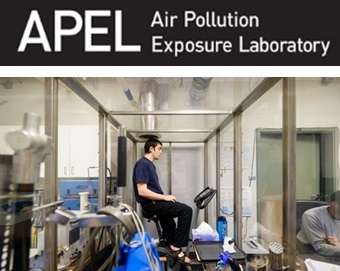 The Air Pollution Exposure Laboratory (APEL) is integral to our Centre. This facility provides a controlled exposure laboratory to learn more about the health impacts associated with various inhaled air pollutants, primarily those present in diesel exhaust. We focus on diesel exhaust because it reflects a major source of traffic-related air pollution. Diesel exhaust contains high quantities of tiny particles and of gaseous pollutants. Both of these types of substances have been associated with respiratory and cardiovascular health problems. Currently, we are actively building a new Translational Research Environmental Exposure Suite (TREES) for clinical, animal, and cell experimental models. TREES development will be paired with the existing and functioning Air Pollution Exposure Laboratory (APEL) within COERD. APEL TREES will allow for the integration and mutual complementation of clinical, animal, and cell experimental models into a single laboratory to compensate for the deficiencies in each experimental model system. Clinical exposure models represent the most directly relevant to human condition, yet limitations exist including ethical issues, patient safety, and limited use of experimental compounds. Animal models are useful as they have an intact whole body physiology and can allow for genetic manipulation, yet they differ in airway physiology and lung anatomy. Cell models offer the opportunity to have a highly controlled environment with human material, but lacks intact whole body physiology. APEL TREES multiple complimentary experimental model systems that feedback in an iterative approach represents a strategy to generate robust, relevant data, for human health, informing policy, and generation of commercialization opportunities. Collectively, APEL TREES will be unique in Canada, and rivaled by few labs internationally. We are heavily focused on respiratory research, but are also collaborating and performing preliminary studies probing the impact of environmental exposures on cognitive function, gastrointestinal disease, and cardiovascular disease. Partners include academia, non-government organizations, Health Canada, and private industry partners. Estimated time of completion for construction of TREES is Summer 2016.